There is nothing that can replace the image of that rare animal (which takes hours of searching and waiting), from a close look, as if you were next to it. Binoculars are a great tool to see animals that are close and can help to distinguish the ones that are far away. But for long distances (something that happens a lot in nature), you will be amazed about what a spotting scope can offer you. You could distinguish many more animals and see details of them that you never had imagined. Spotting scopes have an incredible magnification power build in a light construction. They can also with stand harsh weather conditions and offer spectacular optics. Do you want to buy a spotting scope, but don't have a clue which one you should go for? 1. What are s﻿potting scopes? 2. What are the differences between an astronomical telescope and a spotting s﻿cope? 6﻿. Range of prices: are spotting scopes that expensive? 1. What are spotting scopes? A terrestrial telescope or spotting scope is similar to a small astronomical telescope, with several technical modifications. Spotting scopes are used primarily by bird and animal lovers and field scientists for animal watching, but it can also be used by enthusiastic beginners in astronomy. 2. What are the differences between an astronomical telescope and a spotting scope? → The first and most obvious one is the use of the telescopes. An astronomical telescope is used for sky observation at night. While a spotting scope can be used to watch stars and planets, its main use is spotting animals during the day. → A spotting scope is much smaller and portable than a telescope. While spotting animals requires a constant movement, the elements in the sky like stars have a barely perceptible movement and most of the times it is not necessary to move te telescope from position. → A spotting scope has a lot less zoom than its night relative. → You use a conventional tripod for a spotting scope, while you need one specific if you have a telescope. ○ Body. It is the central part of the equipment and inside it contains all the lenses that have been processed and coated. ○ Eyepiece. Spotting scopes eyepieces can normally be interchangeable and you can choose between a zoom and fixed type. In the eyepiece the magnification power will be reflected (they are usually from 15x to 60x). This will be explained further down in the text. In many cases, especially in top quality models, the eyepiece is not included when buying a scope, which will had to be purchased separately. ○ The tripod and its adapter. Contrary to what one might think, this element is not at all secondary. Although the scope itself might have a superb optical quality, if it has no stable and robust tripod, you won’t be able to see clearly through the scope. ○ The case that covers the body and the eyepiece is essential to protect the scope of scratches and harsh weather conditions. ○ Types of spotting scopes: Angled body or a straight spotting scope? Choosing between these two types depends on the needs of every watcher. There is no correct or incorrect decision. Still, most of the users have an angled one. Angled body spotting scope: they allow to observe with a more relaxed and comfortable position, while having to lean slightly towards the eyepiece. It is a good choice when observing birds in a group, because the tripod can be positioned in a lower position, avoiding changing its height constantly. Straight body spotting scope: they are known for being easier to spot flying birds. They are also the ideal option for those who enjoy watching animals from the car. There are some parameters that you should know before purchasing any scope. The coatings in lenses reduce reflection and chromatic aberration, offering as a result brighter, more contrasted and defined images. Coated: one or more surfaces are treated partially. Fully Coated: all the surfaces of the lenses are treated with an anti-reflective layer. Multi-Coated: one or more surfaces are treated with multi layers of a chemical compound and with magnesium fluoride. Fully Multi-Coated: It’s the most complete treatment of all. All the surfaces of the lenses have been treated with multiple layers of a special chemical compound. Top quality spotting scopes are designed with fluorite (FL) lenses, which is even better than Fully Multi-Coated lenses. The difference between them and the telescopes built with all the other coated lenses is huge: you will get really great images in low light situations and with ultra zoomed-in images. There are also HD (High Definition) or ED (Extra Low Dispersion Glass) lenses. They almost fully reduce the optical errors of the lenses. Spotting scopes are middle range telescopes, normally with a zoom power between 15x to 60x, but they can reach even more. To change the capacity of the magnification power, you just have to change the eyepiece with the zoom that you are looking for. Do not forget that the more magnification power you are using, less light and field of view you will have. Also, the image will be less stable and more shaky due to vibrations. Spotting scopes are consist of two independent parts: the body and the eyepiece. The eyepiece defines the magnification of the image and it can be with zoom or fixed. The most popular ones are the eyepieces with zoom, due to its versatility and flexibility. With a simple adjustment you can change your view from 20x to 60x. The fixed eyepieces have better quality for tacking photos, so they are recommended when using the scope for digiscoping. The lens size refers to the diameter of the front. It is the area in which the outside light enters through the spotting scope. To have as bright as possible images, you will need a spotting scope that captures the most possible light, something that you get with big diameter lenses. So with a larger opening, the brighter the scope is and therefore, the better the observations. But this also means the more expensive the scope. Most scopes have its objective lenses diameter between 50 and 90 mm. As with binoculars, the two separated by numbers separated by an "x" refer to: magnification power x objective lens size. How much do you have to approach your eye to the eyepiece to be able to observe the entire field of vision and a clear image? This distance is measured by the eye relief. It is a parameter to consider with particular interest for those who wear glasses and do not want to take them off whenever they want to watch throuhg the eyepiece. Usually, the adequate distance for any observer is between 12 and 15 mm. This parameter is basically the width of the image you are able to see through the scope. The bigger, the wider the image will be. For watching wildlife the ideal scopes have a large field of view, it facilitates the task of locating moving animals, such as birds. THowever, the larger the field of view you want to have, the less zoom you can use. When you are used to walking in nature with your spotting scope, thse factors become very important. You have to be aware of the weight of the scope, but also of the tripod. Some new series of Swarovski offer the possibility to divide the body of the scope in two parts. So you can take them easily in a backpack and divide the weight. Although it is not totally necessary, it is interesting to have a spotting scope that can focus from close objects to far items in the shortest time possible. Normally there are two ways to handle the focus. It can be a focus ring placed on the scope body, or a small button close to the eyepiece. When having expensive equipment that you carry around a lot, warranty and post sale service are very important. Swarovski and Vortex for example (among other brands) are well known and appreciated for its repair and warranty services. Practically all the famous manufacturers binoculars also sell their own spotting scopes. 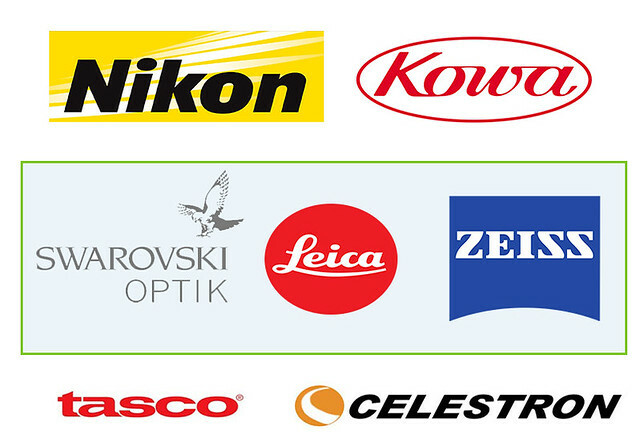 The most famous brands that offer the best products on the market are: Swarovski, Leica, Zeiss, Nikon, Kite, Vortex, Vanguard and Kowa. Other less known brands that offer cheaper designs are Bushnell, Bresser, Celestron, Yukon, Hawke, Konus, Tasco, Alpen, Minox, Vixen, Opticron and National Geographic. 6. Range of prices: Are scopes that expensive? The price range of spotting scopes (plus all the necessary equipment) can vary greatly. The cheapest ones, and often of a quality that leaves much to be desired, can be around 250$. On the opposite, the price of a professional and high quality scope can reach 2,500$ or more. Quite expensive, but the image quality of these ones are out of the ordinary. My recommendation is not to buy anything below 500$. That is because when buying a spotting scope, you would be searching for a better image quality and zoom than some binoculars. To achieve that, you have to invest quite a bit more to be able to clearly appreciate the difference.